For those of you active in LE, have a permit or believe in the 2nd Amendment please read the anti-gun. policy of Goodyear. This policy applies to off-duty LE personal and I'm sure to anybody with peace officer status in NY. I am a strong supporter of BUY AMERICAN but will make a big exception in the future because of this policy. I normally don't fight other people battles, but also don't shop where I'm not wanted. Trust me, I sent them a stinging letter regarding this! Thank you for contacting our web site and for voicing your concerns. In an effort to ensure the safety and security of our associates and customers, we have had a clear company policy regarding weapons in the workplace, since 2004. The Goodyear Tire and Rubber Co. prohibits all persons who enter Company property from carrying a handgun, firearm, or prohibited weapon of any kind onto the property regardless of whether the person is licensed to carry the weapon or not. Exceptions apply to on-duty law enforcement personnel. This policy applies to all Company employees, visitors, customers, and contractors on Company property -- including our Company owned stores. All Company properties have received a decal or sign referencing this policy, and have been instructed to post it. oh dear no firearms to be carried in a vechile with goodyear tyres from now on cause we wont be buying them!!!! Won't be buying from them , i don't go in stores or restaurants that post the no gun signs. That excludes a lot of business in Texas. Will have to check next time I go by one of their stores. Sorry, but concealed is concealed. Here in Missouri all they can do is ask us to leave. Now that sign says CONSEALED-not any firearms.In oregon that might be grounds with a good sheister attourney for a lawsuit against goodyear for not properly posting the details! On another note goodyear can go "F" itself along with costco as I don't do business with them either due to it's CC policies! 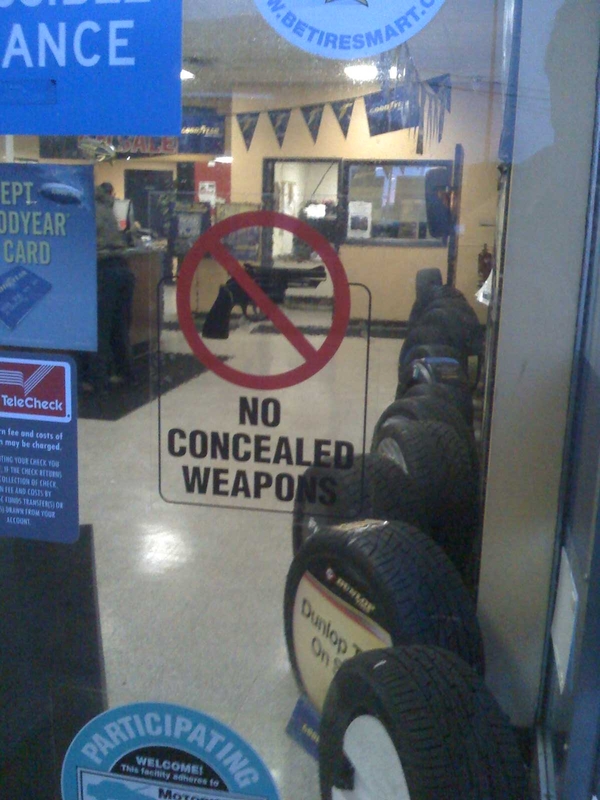 Les schwab tires is an oregon corp,and gun friendly. No big loss to me - I don't care for their products but I wonder if anyone has told NASCAR or the teams about this yet? anyone know how to get in touch with them? Goodyear have had this policy for almost a decade & the email response from Barbara is word for word the one used back in 2005. Goodyear also caved in to the noise nazis in the EU & stopped selling the best dual purpose tyres I've ever used on the truck. So now I shop for alternatives. Dunlop, Kelly, Sava, and Fulda all fall under the Goodyear banner !!! BFG's all terrains........ best tires I've ever owned !! !